You never know when you’ll hear the end of a story. I suppose in a book you can feel the weight of pages and know you’re getting close, but in life there’s no such aid. Ends come unexpectedly. I remember the white flyer on the door of a gas station in New Madrid. This was back on the Mississippi River on the Missouri side across a long bend that retreats all the way from Tennessee into Kentucky. 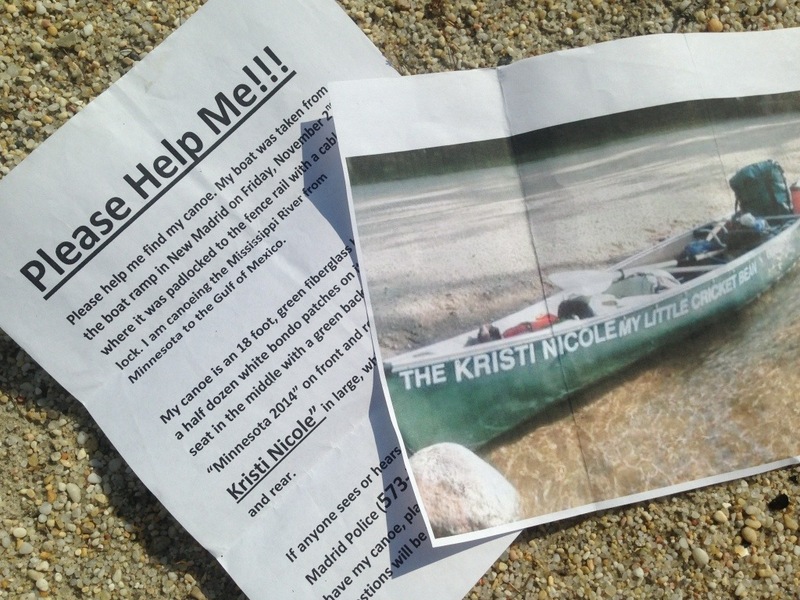 It described the canoe as “18 foot, green fiberglass with a half dozen white bondo patches on it,” “one seat in the middle with a green back rest,” and “The Kristi Nicole” painted in large, white letters on the hull. I read between the lines and saw that it was so much more than a disposable piece of equipment. I saw years spent in the patched holes. I saw the river slipping by from that single seat. I saw the fresh, white paint–still sticky with hopes and dreams–when he spelled out “Kristi Nicole” across the hull. I never left my kayak for long after that. I didn’t want my dream stolen on the side of a riverbank. I only leave it in grandmother’s garages where it will be safe while I fly up to Minnesota to talk at the Midwest Mountaineering Expo. “Yea, someone stole my canoe,” the man said. I was wandering around looking at booths and filling my head with possible adventures when I heard it. The man had been telling me about the Ice Age Trail in Wisconsin, but the conversation had shifted to paddling. I looked at him like he was a ghost. Then he pulled out a copy of the flyer and a picture of the boat. There it was with “The Kristi Nicole My Little Cricket Bean” painted on the side. Someone had offered him a canoe to replace her, but he’d turned them down. He wanted to finish in The Kristi Nicole or not at all. He named it after a woman he loves who no longer loves him. They keep in touch though. She told him she hated the name and wanted him to change it, but he kept it anyway. You can’t replace a boat like that off the rack. You never know when you’ll hear the end of a story, maybe never, maybe all we ever get are pieces. I got an email from him when I landed in Charleston. Posted in Angle to Key WestTagged Angle to Key West, expo, lost boat man, mississippi river, new madrid, storybook endingsBookmark the permalink. Incredible!!! What are the odds you would meet him??? Great blog! Great to hear he got his boat back and was continuing his trip!!! Daniel — I’ve been following your adventure for months and am somewhat living vicariously through you. I hate for my first comment on your site to be anything but full of praise, but I wanted to point out that there are only 30 days in April. I think this post should be for May 1. Continued good luck. I’ll be rooting you on. Puh-leeze!!!! What have you named your kayak, Odin?!? Wow, the more you communicate with people the more you realize how connected we are and how small the world is….